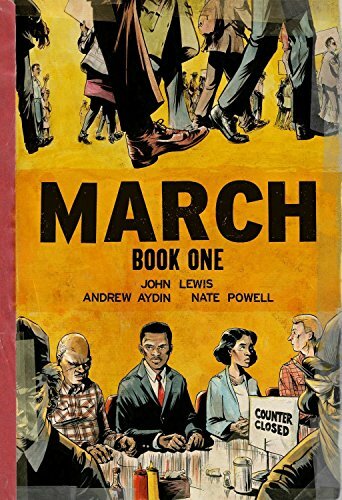 The story of Congressman John Lewis’ earliest days as a young man is at the center of the new graphic novel March Book One. Like the calm at the eye of a hurricane, a whirlwind of stories, people, violence, and history changing action spins around the heart, mind, and soul of the man at its center. As the story of Rep. Lewis’ role in the Civil Rights Movement of the late fifties and early sixties unfolds he and cowriter Andrew Aydin provide deep insight into the drive, focus, and determination of those who tried to cross the Edmund Pettus Bridge that bloody and memorable day in 1965. With minimal dialogue and little in the way of exposition, they let the story tell itself. Scenes shift with the sense of time that allows the reader to see how the moments of our life add up to something greater than we ever imagined. We see the congressman as a child sharing a bed with his other siblings. Then we are standing in his office as he meets a mother and her sons on the morning or Inauguration Day 2008. As a phone rings in his office the action moves inside Rep. Lewis’ college dormitory where he, as a student, picks up the phone to find out that a supporters house has been bombed. Hanging over the entire story is the thought and presence of Dr. Martin Luther King. In the face of horrific violence, bombings and the threat of death, it is the weight of his message of non-violence that unites those who move against the racism of the times together. There is more than one march going on inside this book. There is the march of a young man toward his future, the march of a nation toward something greater, the march of a people to unite ideologically against oppression, and there is also the march of a group of young people toward their own self-realization. Several times throughout the book the younger generation realizes that some of their leaders are looking for appeasement, a way to just move forward a short distance, saving the next step for another day. Realizing that this cannot ever be the case when it comes to discrimination, for as Rep. Lewis realizes, any settlement for half a victory in the battle is still segregation. Working in a fitting color palette of black and white, two colors with infinite shadings and interpretations; the story begins with an open panel that has no borders. The thought inside that lone panel is surrounded by pure white. At first glance we aren’t even sure what the artist Nate Powell is showing us. The lines are definite, but the impression is vague. It could be a fence, the frame to a wall, or even the bars of a prison cell. The image implies boundaries; someone (or something) is being either kept out, or kept in. When the next page opens we see a bridge with the title "Edmund Pettis Bridge" across the top. A line of people is moving in an orderly fashion across the space. At the bottom there is a closeup of a man wearing a helmet and holding a bullhorn. To his left another man is seen loading shells into a shotgun. In the very next panel a long shot shows us the mass of law enforcement that has gathered to stop this march. Significantly we no longer see the group that is advancing toward them. They now appear lost on the other side as the distance that they must pass to get there seems infinite. As the violence begins tear gas is deployed. The scene closes as we see the hands of a man grabbing against the pavement of the bridge as he is being pulled back into the blackness. Mr. Powell expertly uses shadows and light to underscore the great divide between black and white at the time. When a group of students conduct a sit in at a local lunch counter, store management shuts the lights around them off. As these people attempt to peacefully enter white society as equals, their own blackness falls seems to blanket them once again. In a book that never blinks when reminding us at the violence involved in the actions, one moment of real hate stands out among all others. After being arrested for a demonstration, the students and protesters are brought before a judge. After denying a few motions placed before him, motions that each person arrested has a constitutional right to, he arrogantly turns away and refuses to acknowledge counsel until the lawyer has stopped speaking. No gesture of hate in this book, no name-calling, and no nightstick falling across the head of an innocent man or woman screams more with hate than this quiet moment on the bench of an American court. In 1958 a one-shot comic book titled Martin Luther King and the Montgomery Story inspired students and protesters of the time. Today the comic book format has, like all art forms eventually do, evolved into something new, the graphic novel. March Book One is a brilliant example of how the format can inspire and educate. It is a book that should be placed voluntarily on the shelf of every public and private school in America. It is promise at the heart of the American Constitution in action. We have a natural, given right to be free.